Thanks to my website, I could get in touch with an incredible number of wonderful people from all over the world. There are links in different areas of the aldweb Site, all of them are part of what I call the "aldweb network". This image tries to explain different things about this "aldweb network": it focuses on the main topics my website is working on and it shows the very special relationship built with a few sites. in the pink square, Web design: I group in this category my two award winning software, Ma Page Web (simple webpage editor) and GuppY (the easy PHP webportal, previously known as miniPortail). in the blue square, Pocket Devices: I put in this category my two hobbies for the old Pocket Computer devices of the 1980's and the much newer programming of Palm PDA devices. the Support "Ma Page Web" website of my friend Nicolas, from France. Nicolas is doing a great job in providing an accurate and efficient free support to all Ma Page Web users. Simon's Pocket Computer Resources. Simon, from Germany, shares the same hobby as me for the Sharp Pocket Computer PC-1360. These two sites are about 3 years old partners of my website and I especially appreciate them. my personal aldweb Site of course. the GuppY website. GuppY was initially hosted on my personal website like any other of my freeware & shareware software, but it became over the months such a team project thanks to the enthousiasm of many people that it was decided to move it to a dedicated website to help this project keep growing. 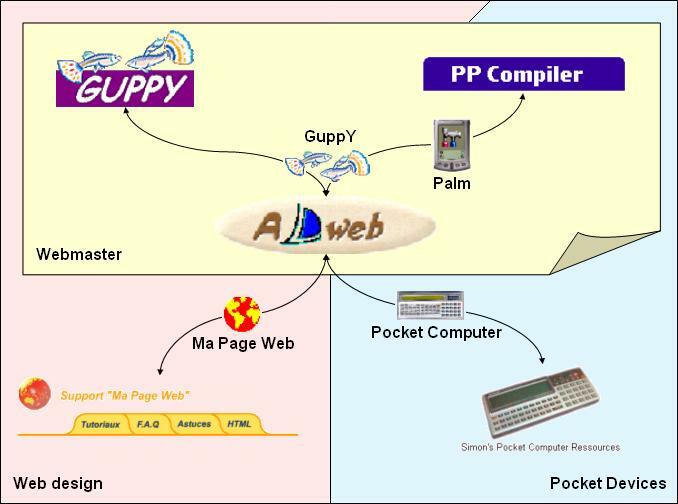 the PPCompiler website, which is the official website for the on board Palm devices Pascal Compiler. C'est KGOUL . Je vous félécite du travail que vous avez fait. Moi aussi je rêve de trouver une personne qui voudrait , ou qui pourrait m'aider à créer un site WEB. D'autant plus que je suis journaliste , et j'ai beaucoup de choses à dire et à partager!!! Le lien vers PPCompiler a été corrigé. Merci hp de l'avoir relevé.